McALLEN — In the category “Valley athlete playing furthest from home,” let’s just go ahead and give the medal to Gabby Lerma right now. 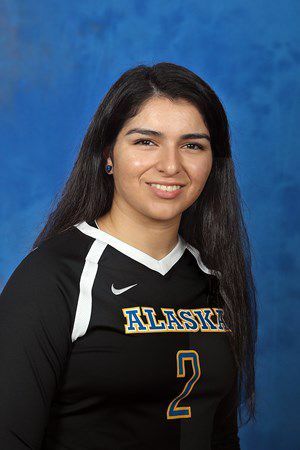 Lerma is a full 4,255 miles away, playing outside hitter for the University of Alaska-Fairbanks’ volleyball team. The UA-Fairbanks Nanooks, in NCAA Division II, play just 200 miles from the arctic circle and are located on a real frozen tundra — an estimated 70-hour drive from the palm trees of the Rio Grande Valley. So how did Lerma, the Monitor’s 2015 All-Area Player of the Year, end up so far from home? She wanted to play at the next level, feed her youthful curiosity for travel, and she loved the green, wooded campus. UA-Fairbanks plays in the Great Northwest Athletic Conference with UA-Anchorage and DII schools mostly in Washington state and Oregon. Lerma has made the most of her opportunity to travel. The Nanooks have competed in tournaments in Virginia and San Francisco, and they have also played games in North Carolina, Idaho, Montana and Oregon. The sophomore, who spent her freshman year at Cameron University in Oklahoma, has also done well on the court. She’s third on the team in total points (205) and kills (181) and has added 18 assists. On defense, Lerma’s 138 digs are fourth best for the Nanooks (10-11 overall). Her outstanding performances got the notice of the D2 West Region Volleyball Showcase tournament in San Francisco in early September. Lerma played some of her best matches of the year as the team went 3-1. She had statistical season highs against the University of Hawaii-Hilo (18 kills) and Biola University (17 digs) and was named to the all-tournament team. The circuitous route that led her to play far away from home is not that uncommon. The Valley has athletes competing collegiately in New York, Mississippi, Wisconsin and other states. But, her decision to travel nearly 4,300 miles away — north of Canada — demonstrates how important volleyball is to Lerma. “Hard work and dedication pays off in the end,” Lerma said from a snowy, 11-degree UA-Fairbanks campus on Sunday.